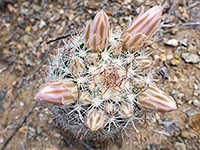 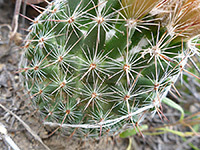 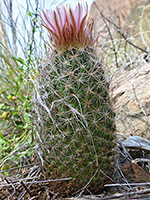 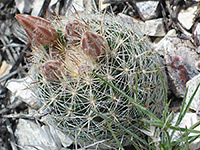 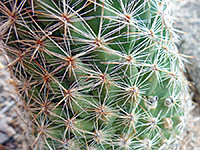 Once classed as coryphantha tuberculosa, escobaria tuberculosa forms small spherical or cylindrical stems, 2 inches or less in diameter and up to 6 inches in height, which readily branch to create clusters of up to 50 members, all covered in a very dense lattice of short white or grey spines. 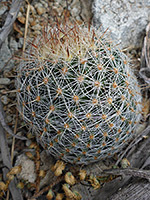 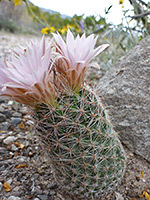 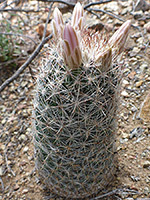 There are usually between 15 and 40 radials and 5 darker-tipped central spines, longest about 3/4 of an inch; all grow on tubercles, though these are largely or entirely hidden. 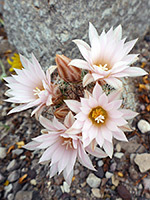 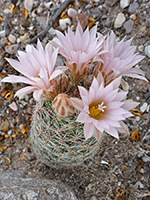 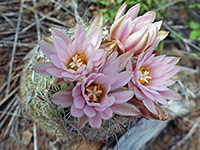 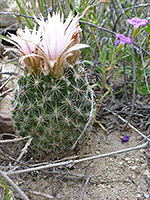 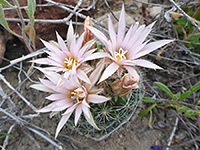 Pale pink flowers appear at the top of each stem during late spring and summer, between 1 and 2 inches across. 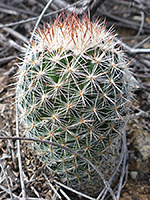 The fruits are normally bright red.